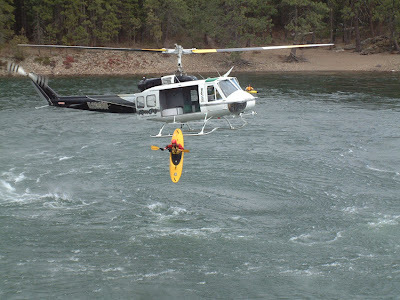 This heli seal launch took place on March 19, 2004 on the Spokane River near Corban Park. The owner and pilot of the helicopter is Jack Scanlon of River City Helicopters. James Black and a couple friends took this day to do something they wanted to do for a long time! Here’s the shot of James Black, dropping about 30feet out of the helicopter. Thats f-ing lame. Like its a first D or something.Get a grip.